The revelation of newly released classified documents from WikiLeaks about the Afghanistan War has prompted the New York Times headline, "View is Bleaker Than Official Portrayal of War in Afghanistan." This is true, but the real question I want to pose is this: how many people have been taking the official portrayal of the war in Afghanistan at face value? After being boondoggled by the previous administration into invading Iraq and being falsely promised by the current administration to have Guantanamo Bay closed by 2010 I would be shocked if people who read the WikiLeaks documents are, well, shocked. What are some of the "earth shattering" revelations? 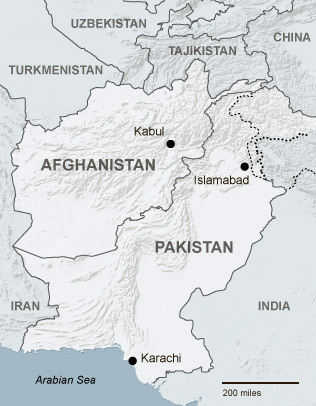 The report outlines the corruption and outright collaboration of Pakistan's Inter-Services Intelligence (the equivalent of America's CIA) with Taliban/Al-Qaeda/Haqqani forces in the border region of Pakistan and Afghanistan. We knew that the border between Pakistan and Afghanistan was a mess and that "Islamabad has no tangible control over the area." What we did not know (though certainly could have ascertained given the agency's history) is that the reason Islamabad has no control over the region is that they do not try, and they may even be making the situation worse rather than better. Pakistan's plotting with Afghan insurgents really is not that surprising. Following President Musharraff's resignation and Benazir Bhutto's assassination it was clear that Pakistan as an ally would be a rocky relationship at best. It now seems that the best case scenario is unattainable and the leaks of these documents will further strain the relationship, possibly forcing the Obama administration to confront the Pakistan problem, which is clearly larger than the media and the government have been making of it. Other tidbits from the WikiLeaks documents: there appears to be copious amounts of corruption among the Afghan National Police, there is a lot of tension between the Afghan National Police and the Afghan National Army, civilian casualties are common (both large scale and smaller scale incidents), and friendly fire shootouts between coalition forces occur more frequently than would be desired. “Clearly, there were enemy fighters in the area,” said the spokesman, Maj. John Thomas. “It’s not impossible for small-arms fire to bring down a helicopter." Notice Maj. John Thomas' language: "It's not impossible..." That is a random iteration that we now know has nothing to do with the downing of this helicopter. Combine this with the fact that other reports indicate that Afghan forces are receiving credit for successes by coalition Spec Ops forces and there is serious misinformation floating around about American successes in Afghanistan as a withdrawal deadline of July 2011 has been set. I don't see a withdrawal occurring in July 2011 as impossible. What is impossible is handing over security responsibility to the Afghans in the next decade and expecting it to last. Historically Afghanistan is impossible to govern; to think that our less-than-stellar ten years there will defy centuries of history is naive and dangerous. Kabul may be less than 150 miles away from the border of Pakistan but in reality they are worlds apart. These documents only confirm that.